ISAAC KIRKHAM. There were many Kirkhams in the Staffordshire town of Leek and the nearby village of Meerbrook. They favoured biblical names, such as Jeremiah and Esther, with some being used repeatedly. This sometimes makes identification of individuals difficult. Isaac Kirkham is one of these. 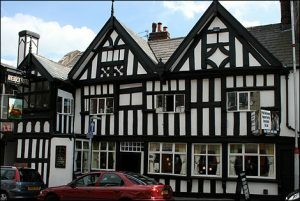 There are two possible baptisms for Isaac Kirkham, both in Leek. Nab Hill is on the north-west side of Leek. We do not hear of Isaac Morris again. He may be recorded subsequently as simply Isaac. The second of these two is perhaps more likely. Leek is a market town in the southern uplands of the Pennines. It was known for its silk industry. We know from the baptism register that Isaac’s wife’s name was Mary. MARY MAYER. Mary was married in Leek, but her baptism has not been found there. The most likely baptism is in the village of Horton, 3 miles west. 1761 Feb 4 Mary Daughr of Wm and Jane Mayer. She was the second of five children. Her youngest brother was baptised in Feb 1767. Ten months later, when Mary was only six, their father died, unless this is an older Wiliam Mayer, and six months after that, their mother. We do not know who took care of the children, but there were other Mayers in Horton. The burial entries for both William and Jane Mayer give their abode as Parkhouse. Park House Farm is on the west of the parish, on the Meerbrook road. Isaac’s parents were from Meerbrook. The Mayers were probably a farming family, but we do not know whether they were farmers or farm labourers. 1785 Nov 24 Isaac Kirkham of this parish bachelor and Mary Meyer of this parish spinster. Both bride and groom signed their names. The witnesses were Rich Myott and Samuel Hulme. They had two, possibly three, children. In 1790 Jun 1 Isaac Kirkham infant was buried. The parents are not named. In 1805 Jan 15 Isaac Kirkham was buried aged 39. This would make him the son of Isaac and Sarah Kirkman, baptised in 1765. Mary’s burial has not been identified.